Sterling residents rest easy knowing we guarantee satisfaction the first time every time. If you’re not totally satisfied with the results following your cleaning, we’ll return to clean any areas of concern at no cost to you. If for whatever reason your still not totally satisfied we’ll refund your money no questions asked. Sterling, Virginia is an unincorporated suburb of Washington, D.C., located in Loudoun County, Virginia. It is located northwest of Herndon, east of Ashburn, and west of Great Falls, and includes part of Dulles International Airport and the former AOL corporate headquarters. Sterling is also home to the National Weather Service building for the Baltimore-Washington Metropolitan Area as well as other commercial office buildings. Broad Run Farms is a residential area north of routes 7 and 28 that was incorporated in 1952. It shares the ZIP code of 20165 and calls itself, alternately, Sterling or Potomac Falls. As an area much older than the surrounding recent growth, it has features unique to the region, including large lots, highly wooded old-growth trees, a wide variety of housing and a voluntary civic association. Bordered to the north by the Potomac and to the west by Broad Run, it was founded in 1950 when Miskel’s Farm, site of a Civil War battle that propelled Confederate Capt. John S. Mosby to fame, was purchased and later subdivided by a U.S. Senate lawyer. The community banded together in 1995 with state and county help to finance and install its own sewer service in part through an added property tax. The lien was paid off several years early and the tax has been retired. 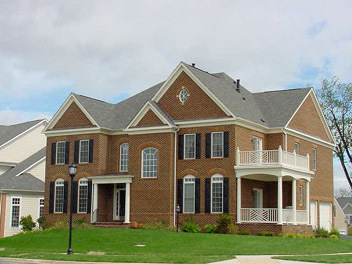 Dulles is an unincorporated census-designated place located in Loudoun County, also part of the Washington Metropolitan Area with zip code 20166. That zip code is assigned to Sterling, although the area covered by Dulles extends well outside the area of Sterling (down to Chantilly, for instance). The headquarters of Orbital Sciences Corporation and ODIN technologies and the former headquarters of MCI Inc. and AOL are located in Dulles. The usage of Dulles as a community name began in the mid-1980s when Loudoun County economic development officer Pam Treadwell successfully lobbied the United States Postal Service to allow Sterling businesses and residents to use Dulles as an alternate address. Potomac Falls is an unincorporated census-designated place also located in Loudoun County. Potomac Falls lies along the Potomac River and is in the northern-most portion of Sterling with the ZIP code of 20165 and borders the state of Maryland. The name for Potomac Falls came from a competition to name the new Post Office, the second one in Sterling. Alternately called Potomac Falls or Sterling, the village consists of the communities Glen Heather, Cascades, CountrySide, Lowes Island, Rivercrest, Potomac Hunt, Great Falls Forest and Great Falls Chase. (Great Falls Forest was first considered a part of Fairfax County, however, when an additional part of the neighborhood was added, it was switched to Loudoun County. Great Falls Chase, is also a new addition to what was previously known as Great Falls Forest.) Development of Potomac Falls began in the early 1990s, and is still in process today. 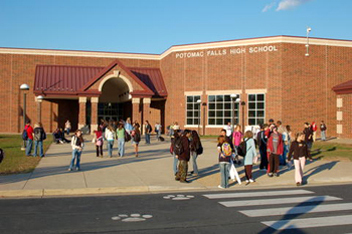 Potomac Falls borders Great Falls and Fairfax County to the southeast and has several shopping areas, schools, and community centers. Potomac Falls is also home to three 18-hole golf courses including Trump National Golf Club and is home to the Potomac Falls High School Panthers. Sterling Park is a portion of Sterling with the ZIP code of 20164. The land where Sterling Park was built was mainly made up of a few very large farms. When construction of Dulles International Airport began in 1959, land prices began to rise. In 1961 Marvin T. Broyhill Sr. saw this as a great investment opportunity and decided to buy the 1,762 acres (7.13 km2) that now make up Sterling Park for the price of $2,115,783.86. Construction of homes priced $14,800 to $22,500 was completed by 1967. Sterling Park was one of the first planned communities built in eastern Loudoun County and was a popular place for government workers to settle with their families outside Washington, D.C. Sterling Park also contains a variety of businesses, churches, parks, a community center, a semi-private golf club featuring two pools and tennis courts, and schools. It is the home of the Park View High School Patriots. Sugarland Run is a portion of Sterling with the ZIP code of 20164. Built in the 1970s in the style of Sterling Park, its only shopping center consists of a 7-Eleven food mart and gas station, a delivery-only Pizza Hut restaurant, a Panda West, a High Up Food Mart, and a laundromat (which burned down on January 10, 2008). The housing closer to Sugarland Elementary consists of townhouses and apartments, whereas single-family homes predominate the land surrounding Meadowland Elementary. It is one of the few communities in the area with contemporary style houses. Sugarland Run also has a community center, which is situated near the preconstructed Willow Lake, and over 26 miles (42 km) of walking paths. There is also a community swimming pool and playground situated across from the lake. The swimming pool is 25 yards (23 m) by 50 meters, with a large diving well and a separate baby pool. It is the home of the Dominion High School Titans. Claude Moore Park occupies 357 acres in Sterling and offers activities for people of all ages. There are two areas: Sportplex includes baseball and softball fields and the nature area includes hiking trails and the park. The last known undeveloped section of the historic Vestal’s Gap Road runs across the park. Originally a trail first used by Native Americans, it was a major route for settlers between Alexandria and the Shenandoah Valley. George Washington used the road frequently in his travels between Mount Vernon and the western frontier. General Braddock’s troops, including Daniel Boone, traveled Vestal’s Gap Road during the French and Indian War.